“Here’s your Soan Papdi and Mishti Doi Cheesecake topped with Mini Gulab Jamun!” This was me to my worse half and the mini monster. Mehebub’s reaction after hearing this was noticeable 😛 . Needless to say, he was not at all happy. Pasta though was confused whether to have it or to follow her father. However, after the initial shock, they both had the Mishti Doi Cheesecake and loved it. They had it without further question as we never ever mistreat or throwaway food. They loved the Mishti Doi Cheesecake because it was not meant to be hated. 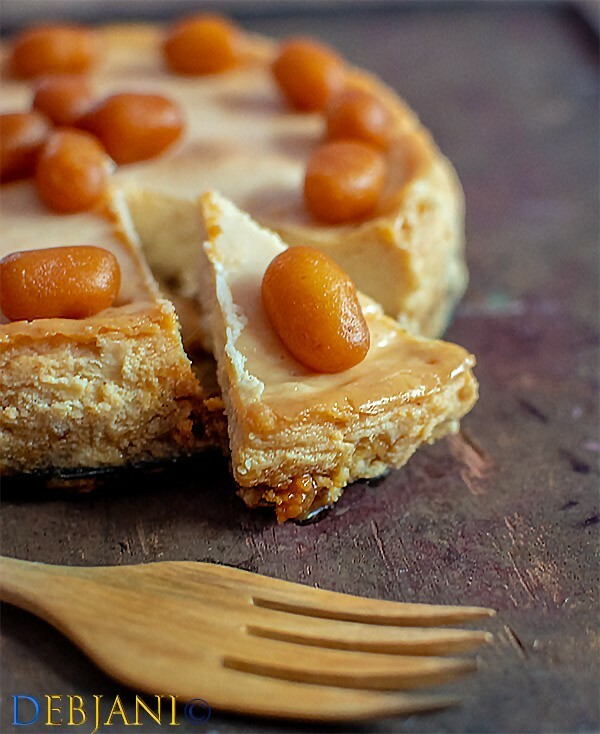 The story behind Baked Soan Papdi and Mishti Doi Cheesecake topped with Mini Gulab Jamun! Now that Diwali is over I am seriously worried about the Soan Papdi, Motichoor Ladoo, Peda, and Besan Ka Ladoo boxes (and not to mention the dry fruits). The entire family including the house helps are horrified and already told me not to give them Soan Papdi/ Kaju Katli with Chaa ( or Pasta’s milk) instead of Marie biscuit! Mehebub and Pasta specifically said “NO” to Ladoo Paratha, Peda Lassi or Soan Papdi Cheesecake 😑😑 and Mehebub, in fact, requested me to take a sabbatical from recipe blogging so that I don’t even think of making the dishes I have mentioned 😆😆😆. Mehebub is still not aware of the 1 kg giftpack of Quinoa which I am planning to utilize as well! Both of us don’t entertain gifts that come directly to our respective office(s) and even after that, we are flooded with the boxes. On a serious note; why don’t we (as a community) think of something productive instead of sending out the gift to those who may not need the boxes! Just a thought and with due respect to whoever gifted us the Diwali boxes. When I posted the above three paragraphs on facebook a friend wanted me to share the recipe of Soan Papdi Cheesecake. I was about to prepare the cheesecake with cream cheese but then decided to check for other options. 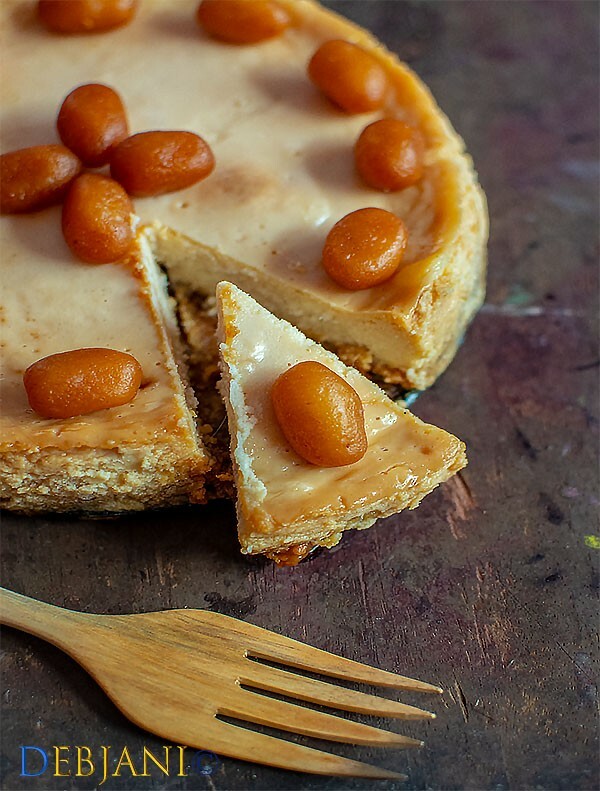 Then only I found the Mishti Doi Cheesecake recipe by Deeba Rajpal. Her recipe was quite easy and when it comes to desserts or baked goodies I follow her blindly 🙂 . 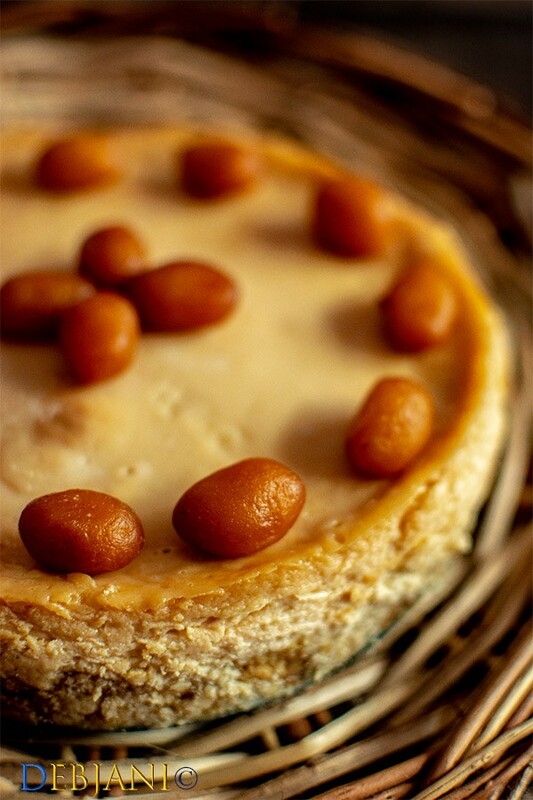 Coming to my Mishti Doi Cheesecake; I took the basic idea from Deeba and then improvised mine. I basically have used Soan Papdi and Mini Gulab Jamun aka Nikuti apart from the Misti Doi. In fact, Soan Papdi was my base with which I replaced crackers/ biscuit. I have mostly used the Soan Papdi and Gulab Jamun from the Diwali boxes. 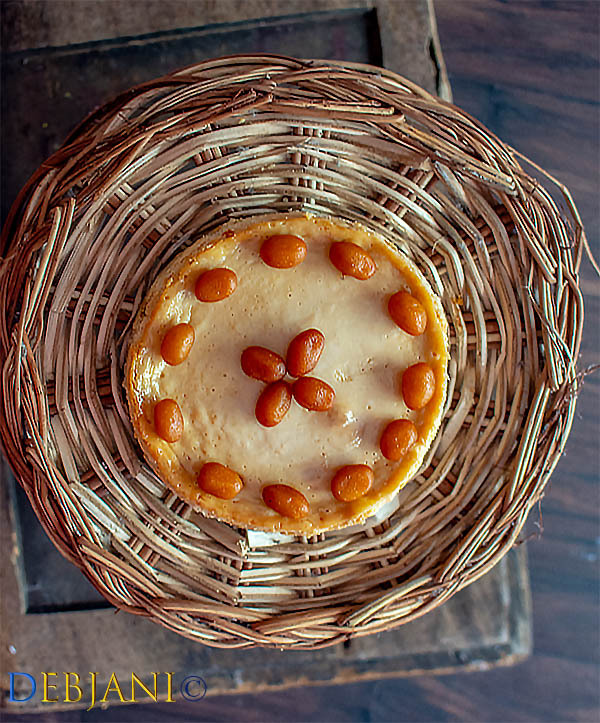 It was an eggless baked Mishti Doi Cheesecake and quite easy to make. I have changed the baking time and also the temperature while baking the cheesecake. In my case, I have opted for low temperature and more baking time and it worked well. I have used leftover Mini Gulab Jamuns to garnish the cheesecake as I wanted to have a minimalistic one. Needless to say garnish part is totally optional. However, the combination of Soan Papdi, Gulab Jamun and Mishti Doi worked well. Here’s how I make Baked Soan Papdi and Mishti Doi Cheesecake topped with Mini Gulab Jamun at Debjanir Rannaghar! An Indianized version of baked eggless cheesecake prepared with Soan Papdi, Mishti Doi and Mini Gulab Jamun; Baked Soan Papdi and Mishti Doi Cheesecake topped with Mini Gulab Jamun is a fusion dessert. Take a muslin cloth and pour the Misti Doi over the cloth and tie the ends of the cloth. Hung the tied cloth from a stand for one hour. This will help in discarding the whey from the curd. 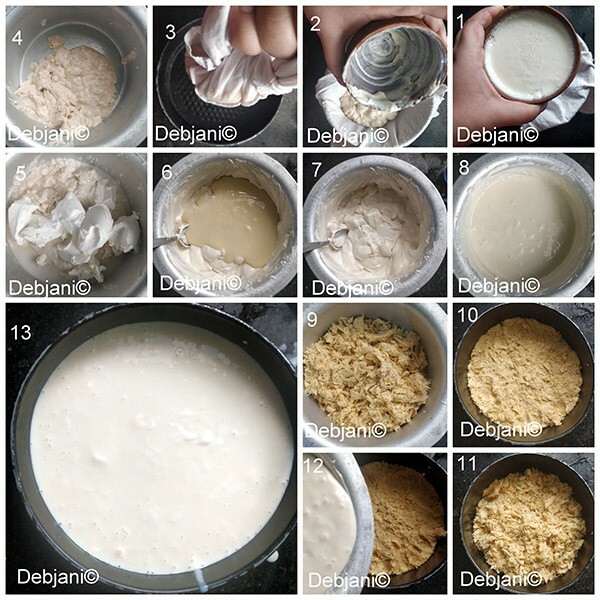 Once there is no whey; take the curd out in a bowl. Blend the curd using a spoon until it smoothens. Now add the solid portion from the single cream followed by the condensed milk. Mix thoroughly to prepare a smooth mixture. By this time pre-heat the oven in 160 degrees C for 15 minutes. 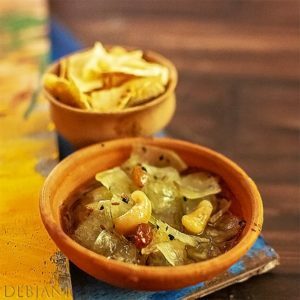 Take Soan Papdi and crumble those using your fingers. Now take a 7" springform pan and pour crumbled Soan Papdi. Using your fingers spread and press the crumbled Soan Papdi to construct the base. Pour the Cheesecake mix and lightly tap the tin. Now bake the Cheesecake for 40-50 minutes or until it sets completely in 160 degrees C.
Once done switch off the oven and take the pan out and then place over a wire rack. Wait until the temperature falls. Once in room temperature de-mold the cheesecake and refrigerate it. While serving, top it with Mini Gulab Jamuns. Both Misti Doi and Condensed milk contains Sugar and hence no need to add extra sugar. I have not opted for elaborate garnishing which is obviously optional. I prefer more baking time and that is why I have opted for baking for around 50 minutes in 160 degrees C. In case you wanted to make it quick; you may opt for 180 degrees C and lesser baking time. A Few Baked goodies from Debjanir Rannaghar! 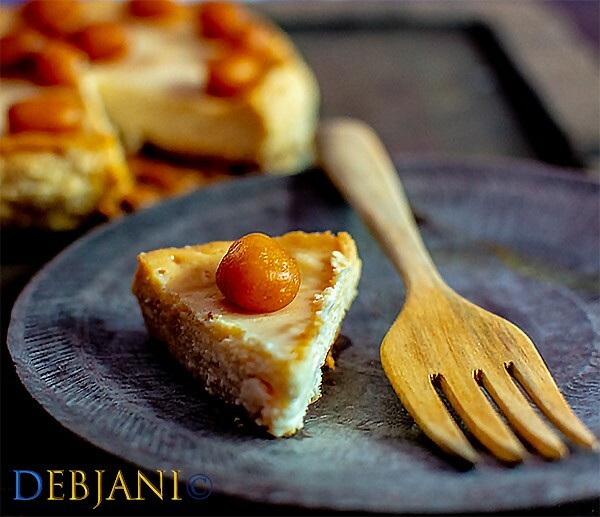 Have you tried the Soan Papdi and Mishti Doi Baked Cheesecake topped with Mini Gulab Jamun recipe from Debjanir Rannaghar!